Home / Blog / Player Feedback From PAX South is in! Here it is the Thursday after the show and I’m still getting caught up! I did have a chance to go through and award the SSDT-Shirt to our email winner, Robert. Congrats! 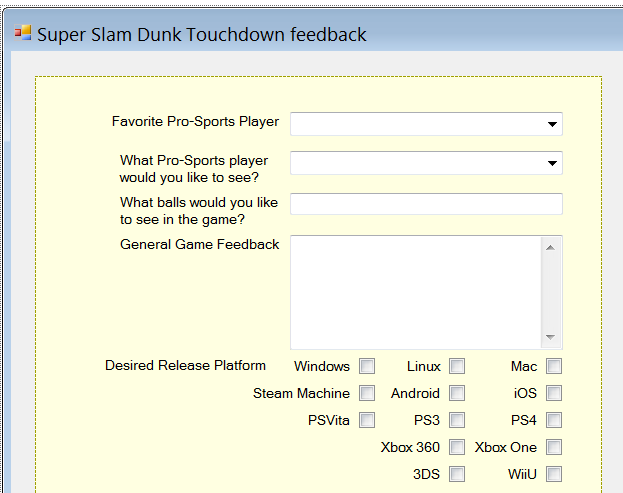 While I was at it, I started going through the player feedback. The feedback was given via a Windows form application running on a netbook, because wifi was not an option in the convention hall! Luckily, my former life in development at given me the know-how to quickly throw together a form that would save the results to disk. Not flashy but it did the job! With 200 odd files I wanted to automate the conversion of this data into a csv file. Luckly, it is quite simple in Visual Studio to loop through files, read them into a string array and split each line at the ‘:’ to get the values. So I built a simple console application to do just that, and spit out a .csv file. 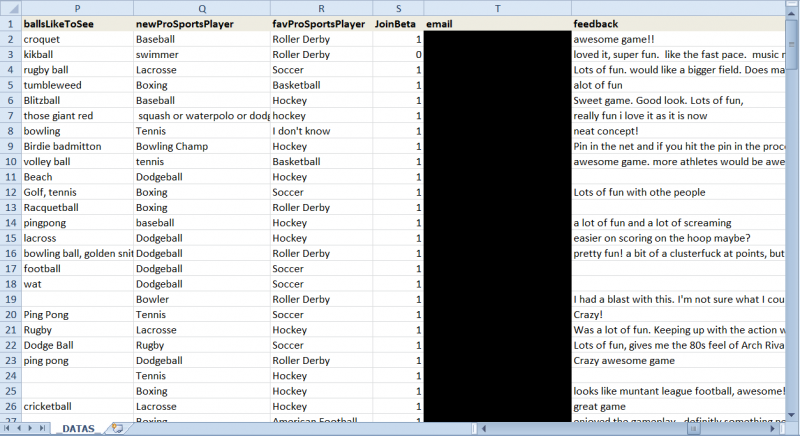 After reading the data, the code spit out a simple CSV file I could easily open in Excel Starter edition. Using Excel Starter was simpler than Google docs while I was debugging my data converter because the files were local, but you could use Google for this sort of thing as well. In fact, I ended up moving it to Google docs anyways because Excel Starter Edition won’t let you freeze header rows. Once in Google docs, I put some totals in at the bottom and some simple conditional formatting too. Fancy! Next I went through player suggestions for balls and new types of athlete for the game, bolding any and all unique ideas that sounded doable. Some of these were from my select box, but players could write in entries as well. Let me show you my datas. 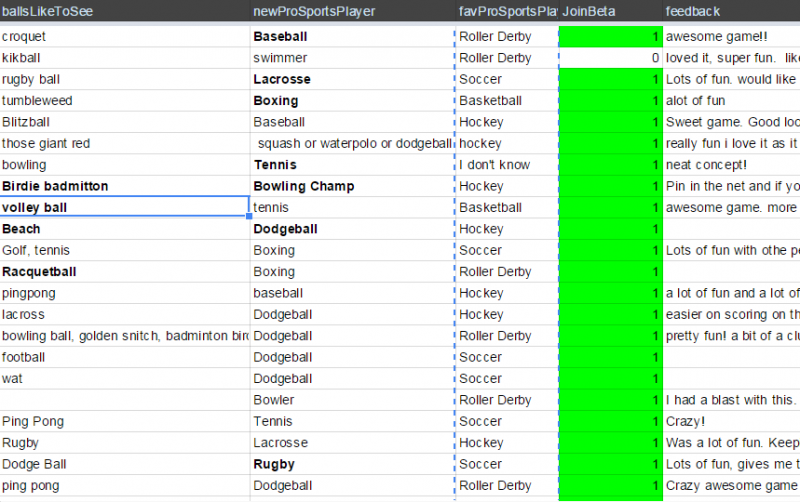 The next interesting thing was players’ favorite in-game athlete type. I had a big list and needed the counts so I could graph it. Luckily I found a handy website (http://www.somacon.com/p568.php) to do the counting for me. With this compiled data, I found another handy website (http://www.jonwinstanley.com/charts) that would throw together the code for a simple Google chart. No coding needed! Way to go, hockey guy! Now all that’s left to do is go through the actual text feedback, and the player and ball metrics from the show (but that’s another post!). General Movement should be faster. Would make for an INCREDIBLE game with just that addition. Plays a lot like Ice Hockey on NES, which is great. Very fun party game. Recommend being able to control the goalies. great game lots of fun. Awesome game. Want to see on a console soon. love the concept. need to play more to get a better sense of it all.